Imagine the scene: Stephen Curry, Kawhi Leonard, Chris Paul, Isaiah Thomas and Chris Bosh, all dressed in white linen suits and Top-Siders, and trying to persuade the NBA’s most coveted free agent to change his address. As the meetings go on behind closed doors, perhaps Kevin Durant’s famous mama, Wanda Pratt, will gaze introspectively out the window at the Atlantic Ocean as Jay Z’s (Momma) I Made It plays in the background. Meanwhile, 1,500 miles away in Oklahoma City, the Thunder and their fans will be nervously hoping for good news. Don’t stress too hard, Thunder fans. Yes, Durant, 27, is the star of this year’s NBA free agency reality show. But barring an incredible sales job, several friends and business colleagues close to the 2014 NBA MVP expect him to return to Oklahoma City for at least another year. The Thunder can show him the most money when he and his Roc Nation Sports agent Rich Kleiman and business manager and friend Charlie Bell meet in Oklahoma City today with Thunder general manager Sam Presti and assistant general manager Troy Weaver. The formulations are complicated, but roughly, he could get $28.4 million annually in an immediate multiyear deal elsewhere versus a projected $30.6 million annually with the Thunder. If he opts for a shorter deal now and a longer one later, he could make from $32.6 million a season elsewhere to as much as $40.7 million a year in Oklahoma City. But Durant has insisted that his decision will center on winning, and he is expected to be open-minded while listening to pitches in The Hamptons from the Golden State Warriors and Los Angeles Clippers on Friday, the San Antonio Spurs and Boston Celtics on Saturday and the Miami Heat on Sunday, ESPN’s Marc Stein reported. The Thunder are also hoping to meet with Durant again after his whirlwind weekend, according to Stein. There probably isn’t a human more adored in Oklahoma City than Durant. “Stay KD” billboards are all over town and No. 35 Thunder jerseys are as commonplace as cowboy boots. Presti has kept a championship caliber roster around Durant and has his trust. NBA All-Star guard Russell Westbrook will be back next season. Durant expressed confidence and respect for head coach Billy Donovan, who faced a lot of adversity during a successful first NBA season. The Thunder were only one win away from an NBA title series before blowing a 3-1 lead over the Warriors in the conference finals. 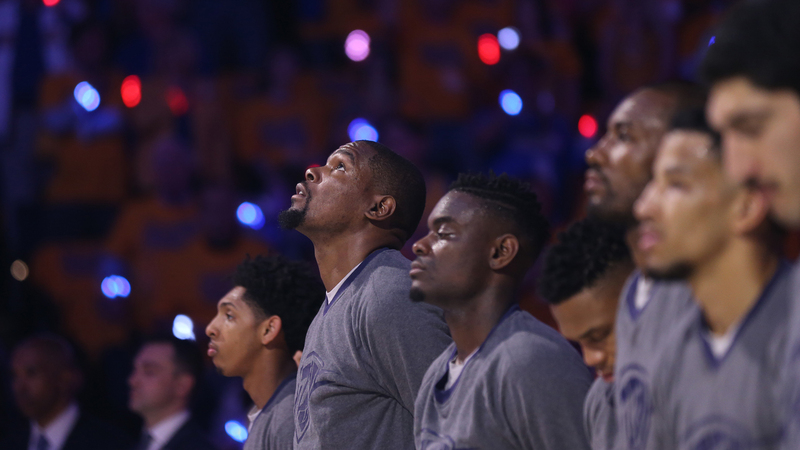 OAKLAND, CA – MAY 16: Kevin Durant #35 of the Oklahoma City Thunder stands for the national anthem before the game against the Golden State Warriors in Game One of the Western Conference Finals. “We wanted to win a championship and the goal going in was to win a title,” Durant previously told The Undefeated. “That’s the worst part. But when you look at it, we have a new coach and we learned a lot from him. We’re basically a new team. I didn’t play with these guys last season. So coming in and playing with a new group of guys, I thought we did a great job. Surely, trading disgruntled forward-center Serge Ibaka last week wasn’t easy for Oklahoma City. But do you really believe that the Thunder made that move without Durant’s blessing? The Thunder’s roster is loaded with young talent, including superstar Westbrook, budding star center Steven Adams, newcomer combo guard Victor Oladipo and forward Ersan Ilyasova, big man Enes Kanter and guards Andre Roberson and Cameron Payne. Don’t expect rookie forward-center Domantas Sabonis to fill Ibaka’s shoes overnight, but ESPN’s Brian Windhorst also reported that the Thunder have interest in Atlanta Hawks free agent forward-center Al Horford. So with all these promising developments in Oklahoma City, why would Durant explore free agency? First of all, Durant has earned the right to be a powerful NBA free agent and it would be a major mistake for him not to do his due diligence. It says a lot about your LeBron James-like power if you can get NBA stars and executives to travel to The Hamptons to woo you despite long odds of success. Durant, one of the NBA’s top three players, is worth the special treatment, the trip and the gamble. The Spurs have the NBA’s most respected coach in Popovich and two All-Stars in Leonard and LaMarcus Aldridge. The Clippers can offer the opportunity to play with a fellow All-Star in Paul, Durant’s good friend and 2016 all-NBA first team center DeAndre Jordan and Oklahoma native Blake Griffin (although he could also be possible sign-and-trade bait). While Miami could be without Bosh because of career-threatening blood clots and All-Star Dwyane Wade, it has general manager mastermind Pat Riley pulling the strings. The Celtics have a talented young roster, All-Star guard Isaiah Thomas, lots of draft picks and salary flexibility. But even though Popovich and Riley can be great salesmen, the only suitor that appears to have the Thunder truly worried is the Warriors. Durant’s addition to the offensively powerful Warriors would make them a more formidable team than the retooled Thunder with Durant back. The Warriors are going to also sell playing for a team that is unselfish, has played in two-straight NBA Finals with three NBA All-Stars in Curry, Klay Thompson and his close friend Draymond Green, and gives Durant the ability to burnish his brand, a source said. A Durant-infused Warriors squad would be the most intimidating offensive foursome in NBA history. But after the Warriors beat Durant in an emotional Western Conference Finals, can he really join them? Often forgotten now is that Durant went from MVP to nearly forgotten after he played only 27 games during the 2014-15 season, mostly because of a foot injury. Meanwhile, Curry leapfrogged Durant and joined James in fan popularity and media attention. Durant regained his footing as one of the NBA’s elite players this season, but there was time lost. Being the face of NBA free agency and the USA Basketball Rio Olympic team this summer gives an added boost to his already hot brand. There is no question that the San Francisco Bay Area, Los Angeles, Boston and the Miami-Fort Lauderdale, Florida, markets are more attractive and entertaining places to live than small-market Oklahoma City. Kevin Durant walking off the court after his last game with the Thunder this season. But with his usual off-season time in L.A. and New York, a source close to Durant said that the city life with his parent franchise would have been more attractive to him five years ago. And thanks to the internet, being in a big-city market doesn’t matter as much now as it did during the days of basketball greats Michael Jordan and Magic Johnson. So relax, Oklahoma City. Durant leaving would be as stunning as James’ departure to Miami and subsequent return to Cleveland. Instead, look for him to sign a one-year deal with the Thunder that would allow Durant and Westbrook to be free agents together in 2017 and co-star in next year’s NBA free agency reality show. That is when it will become much more real. If the Thunder fall short in advancing to the NBA Finals again, it will be a lot easier for Durant to depart from Oklahoma City in 2017. In other words, Thunder fans, save your popcorn for next summer.